I received this book from NetGalley! This is the first book by Tricia Goyer that I have read but after reading this one, I am a big fan!! This book was funny, sweet, and heartbreaking all at once. Sarah does much growing up in this book and learns not to just see what is in front of her. She learns to look deeper. She meets Jathan and learns how to let go of her grief! 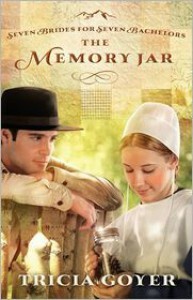 She keeps all her memories of the past in memory jars. Momentos of things that happen in her life. After meeting Jathan the jars no longer make her sad.......This is book one of seven and I can't wait to read the rest of the series!